Unlike other cats, Sumatran Tigers love the water and have webbed toes to help them swim! Tigers are a symbol of all that is powerful about nature. The stripes of the Sumatran tiger are much closer together than in other tiger species which helps them with camouflage. They have large strong front paws with five toes and sharp claws which can be pulled inside while they walk which helps to keep them sharp. It has lived exclusively, for over a million years, in the once extensive humid tropical jungles of the island of Sumatra, Indonesia. The appeal of these magnificent creatures creates tourism value that runs into billions of dollars and contributes to the livelihoods of millions of people. Sumatra is one of the top biodiversity hotspots in the world and as an apex predator Sumatran Tigers are critical in maintaining the balance ecosystem. Being at the top of the food web, the decline of large predators may lead to over-abundance of herbivores such as deer, which in turn has repercussions on tree regeneration and seed dispersal. Such effects reverberate through the food-web, causing long-term changes in natural flora and fauna, eventually leading to species extinction. The Sumatran Tiger will generally hunt at dusk and may travel up to 20 kilometres in a night in search of food. Unlike other members of the cat family, the tiger cannot outrun its prey relying on its camouflage to ambush. This hunting method is slow and patient, stalking through often dense cover until close enough to spring. They will regularly run hoofed prey into water to slow them down to catch. Tigers in general tend to attack from the side or rear at close range and when the prey weighs more than half that of the tiger, a throat bite is used and death is caused by suffocation. What is putting them on the edge? The Sumatran Tiger is considered to be Critically Endangered, with number as low as 400. 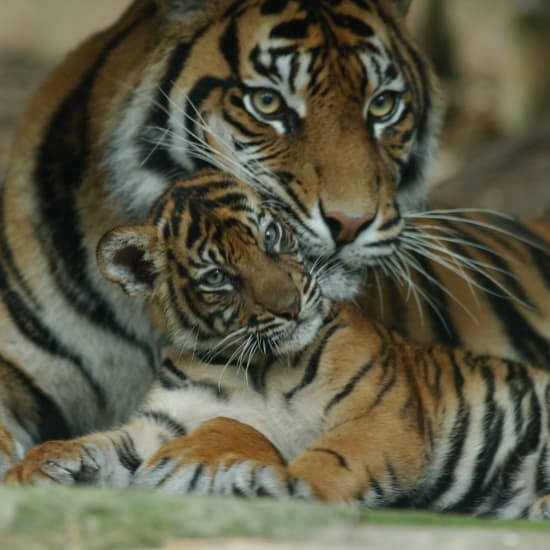 The two major threats to the survival of the Sumatran Tiger are habitat destruction and poaching. The rapid agricultural growth on the island of Sumatra, particularly for oil palm plantations and timber has reduced the area of habitat available to the tiger and the encroachment by villages has increased the contact and conflict between the tiger and humans. Sadly, Tigers are illegally poached to support the trade in tiger products, including their body parts for use in traditional medicine and their pelts as trophies. What is the vision for them? Breeding programs for these big cats are now more important than ever and Taronga is proud to be part of a regional conservation management plan for Sumatran Tigers including breeding, fundraising, research and community action to support sustainably produced Palm Oil. Taronga’s involvement in the International Conservation Insurance Breeding Program is carefully monitored to ensure that the species are managed with high genetic diversity, to provide a healthy and viable insurance population for the future. Taronga also assists with funding Wildlife Protection Units (WPU) to protect the 3,200km2 Bukit Tigapuluh national park refuge in Sumatra. The WPU protect against illegal logging and poaching, which is vital as this region is home to at least 30 Sumatran tigers and has been identified as one of 20 critical habitats for global tiger survival. $34,445 could pay for one WPU ranger for one year’s work at Bukit Tigapuluh. Taronga Conservation Society Australia is bringing partners together to bring this project to life, given their long history in helping Sumatran Tigers. Donate directly to Taronga Zoo.